Working with Program Partners, we improve the quality of life for stranded and orphaned animals on Reservations. In addition to providing basic supplies for their care, we also help fund mobile spay and neuter clinics, care for stray and orphaned animals ... place them in foster care ... and get them ready for adoption into loving homes — where they belong! Enter the 2019 Pet Contest: Show your love for your pet by creating a Sage Page and entering them in our pet contest for a chance to be featured in the next RAR Calendar! Make an Impact: Help change the life of a homeless cat or dog on the reservation with your gift today. Become a RAR Companion — just 50 cents a day helps 12 homeless animals a year! Sign up today to get your two free thank you gifts! Dr. Holgate is always busy helping animals in Tuba City but took the time to share with us 5 lessons she's learned along the way. During a recent visit to our Program Partner, Good Dog Rez-Q, we met several recent rescues who were waiting for their forever homes. 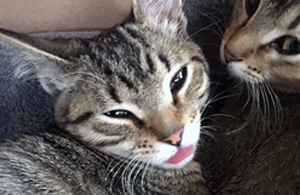 Melanie recently adopted 2 kittens, Jenna and Keegan, from one of our Program Partners when she couldn't say "yes" to just 1. 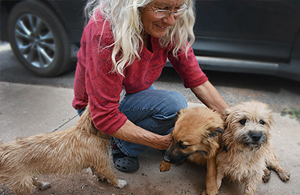 Native American reservations often face the issue of homeless animals without the resources to manage it. When we see innocent animals suffering unnecessarily, we don't want to just speak out ... we want to SHOUT. Show your love for your pet! 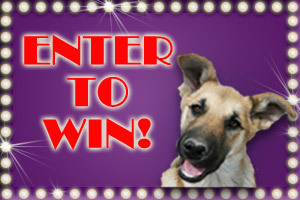 Enter your pet in our FREE Pet of The Month contest for a chance at a spot in our 2020 Calendar! Just set up a simple web page — you'll even receive a special gift just for creating the page.